Pricing cakes is the number one issue that I see baking and cake decorating business owners struggle with. Armed with the right tools and information, cake pricing can be easy! Also included BONUS marketing module with templates, video guides and e-books to help you promote your business. WHAT'S INCLUDED IN 'CAKE PRICING PLUS'? Inside Cake Pricing Plus you will find all of the tools needed to make pricing your cakes a breeze! CAKE PRICING E-BOOK- A PDF guide taking you through creating a livable income, generating your hourly rate, profit margins and recording your information. PRICE CHECKER SPREADSHEET - Input historic and current pricing information for your orders, allowing you to see where you have under or overcharged. It will also help inform all future pricing. CAKE COSTS SPREADSHEET - Calculate exactly how much a batch of cupcakes costs you. This spreadsheet allows you to input ingredient prices, then your recipe amounts to find out the cost of each product you make. TIME AND OVERHEADS SPREADSHEET - Keep all of your business costs and time in one place. Enter all of your overheads and this spreadsheet will tell you how much extra to charge per cake. Also record all the time you spend on your business, which you can them input in to the Cake Pricing Calculator. CAKE PRICE QUICK REFERENCE SPREADSHEET - Over time you will end up pricing the same type of cakes over and over. Enter the flavour, size, style and price into this spreadsheet for quick future reference, to save you going through the whole pricing process each time. *NEW* TUTORIAL VIDEOS - Short step by step videos walking you through each spreadsheet. *Spreadsheets are provided in OpenDocument and Microsoft Excel Worksheet files, can be viewed in Google Drive, Microsoft Excel and Apple Numbers. BUT THAT'S NOT ALL, there are bonuses! BONUS MARKETING MODULE TO HELP YOU SELL ALL OF THESE CAKES YOU'VE JUST EXPERTLY PRICED! MARKETING E-BOOK - How to market your cakes online and locally. PDF MARKETING CHECKLIST - Run through this checklist to keep you accountable and on track with marketing your business. HOW TO PLAN YOUR CAKE BUSINESS WEBSITE! FIVE STEP-BY-STEP PDF E-GUIDES TO WALK YOU THROUGH EXACTLY WHAT YOUR WEBSITE NEEDS TO ATTRACT CUSTOMERS AND MAKE MORE SALES. WHETHER YOU PLAN ON DIY-ING YOUR SITE OR HIRING A DESIGNER. PLAN IT ALL OUT AND FINALLY CHECK 'START A WEBSITE' OFF YOUR TO-DO LIST! Scroll down to check out all the goodies in detail! Input your details and the calculator will tell you what to charge. 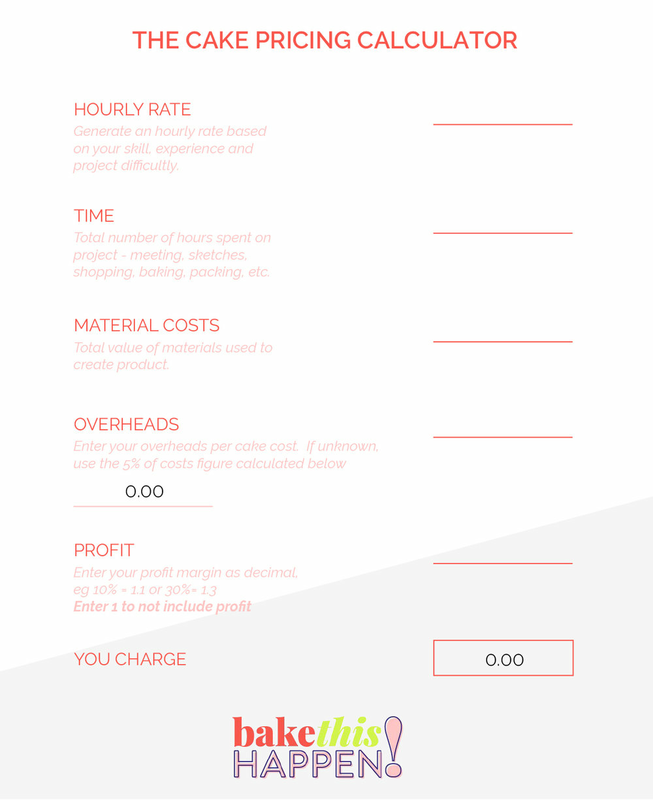 Create an historic pricing checker spreadsheet. What did you charge in the past for your cakes? Track your progression. Newly added tutorial videos for every spreadsheet in the CPP pack. Previous customers have highlighted that sometimes the written instructions weren’t easy to follow so I have created simple tutorial videos that will walk you though every spreadsheet to you can be a pro! How will your website help your business? How will your website serve your customers? If you combine all of the powerful tools in this product you will never have to worry about cake pricing again, your business will flourish and you will be able to make a living doing what you love.